Alwaysmining won the Miracle Wood Stakes at Laurel Park. Photo by Laurie Asseo. Runnymede Racing’s multiple stakes-winning 3-year-old Alwaysmining put in his final breeze Saturday morning ahead of an expected start in the $100,000 Private Terms March 16 at Laurel Park. Alwaysmining went a half-mile over the all-weather track at the Fair Hill Training Center in Elkton, Md. for trainer Kelly Rubley. It was the Stay Thirsty gelding’s second work since extending his win streak to four, the last three in stakes, in the Miracle Wood Feb. 16 at Laurel. Alwaysmining has put together his win streak in front-running fashion, by 18 ¼ combined lengths, kicked off with a 10-length romp going a mile over a sloppy, sealed track last October. 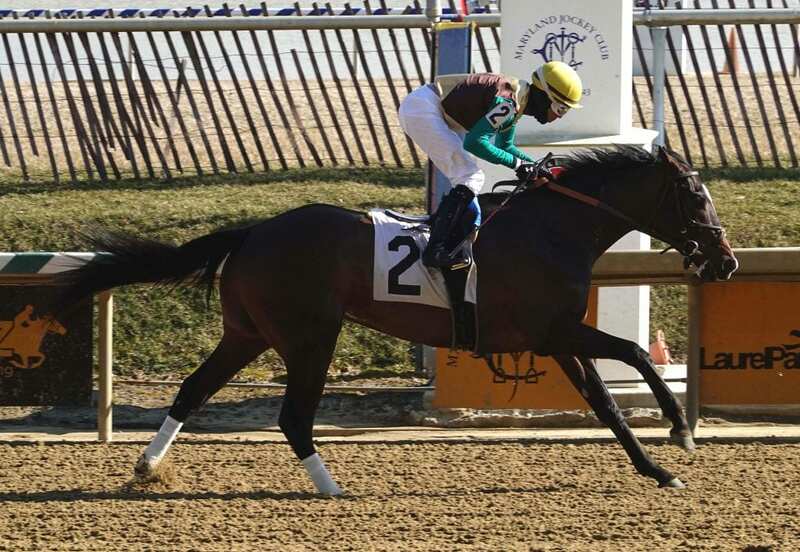 He won the Maryland Juvenile Futurity and Heft Stakes to cap his 2-year-old season, both at seven furlongs, and drew off by 4 ¼ lengths in the one-mile Miracle Wood, his sophomore debut. The Private Terms, contested at about 1 1/16 miles, would mark the two-turn debut of Alwaysmining, who has raced exclusively at Laurel Park with five wins from seven starts. He is also nominated to the Sunland Derby (G3) Sunday, March 24 at Sunland Park. Also working Saturday at Fair Hill for Rubley was West Point Thoroughbreds’ General Downs, winner of the Native Dancer Stakes Jan. 12 at Laurel and fourth last out in the 1 1/8-mile John B. Campbell Feb. 16, beaten 3 ½ lengths. Rubley is targeting the $100,000 Harrison E. Johnson Memorial, also at nine furlongs, for General Downs on a March 16 program that features five stakes worth $450,000 in purses including the $100,000 Beyond the Wire for 3-year-old fillies and a pair of $75,000 events for older Maryland-bred/sired horses – the six-furlong Not For Love and seven-furlong Conniver for females.